Been buying flowers from Angelo's for3 years now and have been nothing but satisfied with their service. They always have a large fresh selection of flowers to choose from for all occasions. Floral delivery services are always on time and fresh! I Don't know why this place has so many negative reviews! I recommend this store ! Best floral shop in Mississauga! 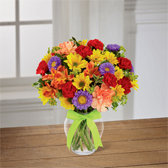 Used Angelos flowers and gifts manytimes to send arrangements. The flowers are always fresh and gorgeous and they have the best customer service. My wife and I were very happy with the work ( flowers and decorations ) in our wedding couple of years ago. I'd suggest calling to place an order. Thank you so much for making my wedding such a beautiful occasion. The flowers were absolutely beautiful for every thing, the decorations and the bouquet. We received many compliments about how beautiful the flowers were. Thank you for such wonderful service! Thank you so much. You made my daughter's day! She texted me a picture of the flowers. They looked just perfect. We received a call on October 9, 2010 from Madlen. I can't thank you enough for your assistance in making our anniversary beautiful! I look forward to working with you in the future. On Mother's Day, May, 2010 - The flowers were so beautiful. The best ever. Thank you so much. Thank you for the great job on the Mother's Day arrangement ordered for mom. It was great. Please tell Sue thank you so much for the fabulous bouquet. It was perfect! The flowers were absolutely gorgeous. To Sue and the great team at Angelo's flowers, thank you for helping me with my flower order for my mother's funeral service. Thank you Sue, who helped me place my order.